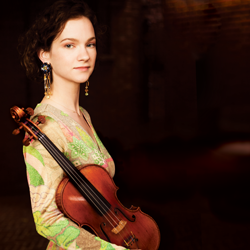 We start with the world-renowned violinist Hilary Hahn. Hilary talks openly and candidly about how she built her performing experience from a young child and how she prepares for a performance. She talks about making mistakes in live performance “it’s not like jumping out of a plane when the parachute doesn’t open!” and her descriptions of how her father taught her how to focus on stage are very funny. Her interview is the longest out of them all but she was so articulate and interesting that I barely edited it – she’s quite an inspiration! In the two decades since her professional debut, three-time Grammy Award-winning violinist Hilary Hahn has brought her virtuosity, expansive interpretations, and creative repertoire choices to diverse global audiences. Hahn has released 15 albums on the Deutsche Grammophon and Sony labels, in addition to three DVDs, an Oscar-nominated movie soundtrack, an award-winning recording for children, and various compilations. Her recordings have received every critical prize in the international press and have met with equal popular success. Her distinct approach to music shows a remarkable ability to honor the traditional violin literature while creating new opportunities for listeners. In 2010, she released Jennifer Higdon’s Violin Concerto along with the Tchaikovsky concerto and in 2013, Hahn released In 27 Pieces: the Hilary Hahn Encores, the culmination of a multi-year project to renew the encore genre. Her next album, slated for Spring 2015, references her musical heritage, featuring works by Mozart and Vieuxtemps and recorded with longtime colleagues Paavo Järvi and The Deutsche Kammerphilharmonie Bremen.